Can't post today. I have a head full of cake and I must meet my Old Nemesis; Piped Icing. Why? 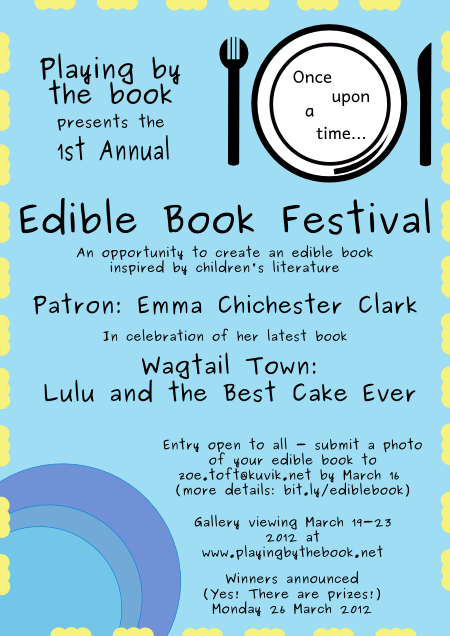 I'm taking part in Playing by the Book's Edible Book Festival. 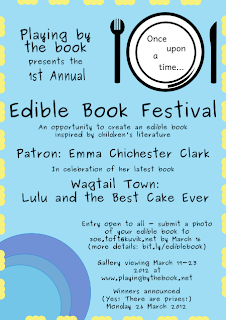 Go here if you would like to take part too. but the scale of it is a little daunting...and both my children are inexplicably 'off' bananas presently so they've vetoed it. So what have we gone for? My lips are sealed in the interests of anonymity in judging. Let's just say it's definitely a classic cover and I've yet to find another cakely interpretation to make me feel inadequate online. Wish me luck and have a go yourselves-especially you Nathalie my Cake Queen friend! Further inspiration/intimidation available on Pinterest here. I'll reveal all in a few weeks time- even if it's just a picture of me weeping in a mound of crumbs. At least there's a cake sale at school today so I know whatever I produce will find a good home if I add enough sprinkles. Hopefully there is no weeping involved, unless it is for joy! I too am cutting out small pieces of **** for facial features, to be assembled tomorrow morning. Exciting but daunting! Can't wait to see yours! Ooo I love this cryptic fever of anticipation. There was no weeping in the end- although my plan to use the orangey bits from inside Jaffa Cakes did not work out as planned...The chocolate was harder to pick off than I remember. shame.